These are the indicators of crisis, subject to data and statistics. Less measurable but no less profound is a sapping of confidence across our land  a nagging fear that America's decline is inevitable, and that the next generation must lower its sights. Today I say to you that the challenges we face are real. They are serious and they are many. They will not be met easily or in a short span of time. But know this, America  they will be met. In reaffirming the greatness of our nation, we understand that greatness is never a given. It must be earned. Our journey has never been one of short-cuts or settling for less. It has not been the path for the faint-hearted  for those who prefer leisure over work, or seek only the pleasures of riches and fame. Rather, it has been the risk takers, the doers, the makers of things  some celebrated but more often men and women obscure in their labor, who have carried us up the long, rugged path towards prosperity and freedom. 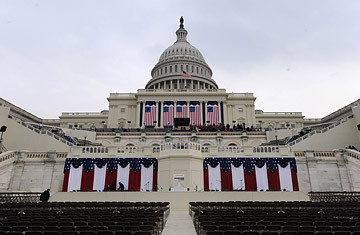 See pictures of Obama's Inauguration. See pictures of Sasha and Malia Obama at the inauguration.